Steve and I went to Open Torch Time at the glass school on Thursday and we got the new beads in the mail today. We’re getting closer to having our torch area set up so then we’ll be able to work right in our basement. We got our first beads in the mail today! I can’t remember which are Steve’s and which are mine, so I’ll have to ask him when he gets home. Our instructor, Starleen, also sent the beads she made in class, but I don’t think any of those are in this bunch. The thing about making my own lampwork is it’s like making candy – I want to keep it all! Stringers & plunging & mandrels… Oh my! Yesterday Steve and I had our first lampworking class at Carlisle School of Glass Art in Millville, NJ. Their facility is large and well-equipped and I highly recommend CSGA if you’re interested in melting some glass. Our instructor, Starleen, was so patient and very good at explaining how to do different things. 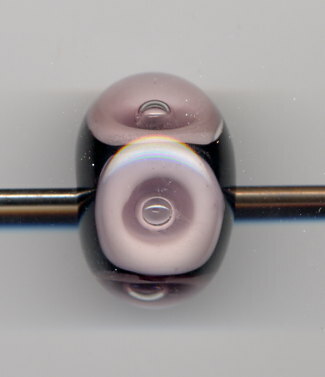 My only complaint is that our beads have to be annealed and didn’t get to come home with us, but we did get to keep some of Starleen’s beauties like this big honkin’ bubble bead. I’ll post pictures of our beads when they come in the mail. Steve did really great and I’m still stoked that he wants to lampwork with me. …with melting glass. My friend Claire has a hothead torch, so today we made some glass beads. 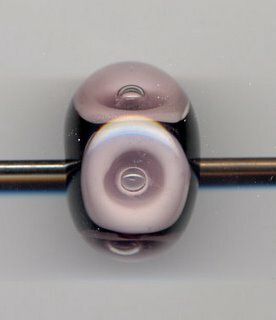 I wanted to see what lampwork was like before Steve and I have our class on Saturday. 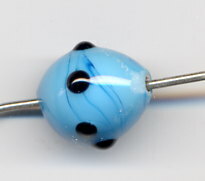 The photo is of my first bead. It hasn’t been kiln annealed yet, so I wanted to get a photo in case it breaks from thermal shock like my second bead did.